A true "man of steel", Childe Harold Wills (his mother named him for a character in a Byron poem—but as soon as he had a choice in the matter, he dropped the first name entirely and became C. Harold or, more simply, C. H.) was a metallurgist and a considerable presence in the early development of the automobile. He worked side by side with the young Henry Ford, turning Ford's back-of-the-envelope ideas into finished drawings. As chief engineer at Ford, he experimented with metal alloys and developed innovative mechanical solutions. Once he left Ford, he went on to develop his own luxury car, the Wills Sainte Claire, a car years ahead of the technology of its time. Outwardly it appeared a handsome, moderate-sized car, though certainly not a flashy one. Its real claim to fame, however, came in its state-of-the-art patented processes, precise engineering, and impressive mechanical features. As with any "new to the market" improved version, however, it had a steep sales price—roughly three thousand dollars when the Model T was fetching less than five hundred. 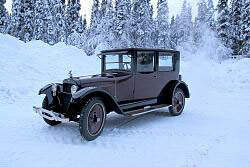 From 1921 to 1927, about twelve thousand of these exceptional cars were built. Of that number fewer than ninety are known to survive. Born June 1, 1878 in Fort Wayne, Indiana, Wills came from European stock, his grandfather having left Scotland for Canada in 1832. His father John Carnegie Wills, however, later crossed the border into the U.S., first settling in Indiana where he launched a family with his wife Mary Engelina Swindell and began building a career as a master railway mechanic. By 1885, the family had moved to Detroit and C. H., the youngest and only surviving child in the family, went to Detroit public schools. He began working at age 12, following in his father's footsteps and learning mechanical skills from his dad. As years went by he progressed with those skills but also showed some promise as a commercial artist, particularly enjoying cartooning. He was beginning to wrestle with the dichotomy between his interests in science and the arts. At 17, though, he'd resolved his dilemma in favor of joining the Detroit Lubricator Co. which provided locomotive lubrication and which was the plant where his dad was manager. There he worked out a four-year apprenticeship, starting as a toolmaker at $7.50 a week, and ending there at $10 a week as a finished toolmaker. Although he had been promised a raise every six months, at the end of four years he'd only gotten one of those—so he decided to look elsewhere for employment. He wasn't idle in the evenings, either, taking classes and reading technical journals about engineering, chemistry and metallurgy. Next, he worked in the engineering department of Boyer Machine Co. (forerunner of Burroughs Adding Machine Co.) at increased pay of $18 a week. After three weeks on the job he was made chief engineer and foreman at $27 a week and in three months he became superintendent with the princely salary of $50 a week. It was from there that he became associated with Henry Ford, automotive pioneer extraordinaire—but more about that later. With the larger salary at Boyer, by 1904 Wills could afford to leave his parents' home to take up residence at Detroit's Plaza Hotel, not that he spent much time there, though. His consuming passion for cars had already turned him into a workaholic. Wills married twice—first to Mabel Preston in 1907, with whom he had daughters Virginia and Josephine and from whom he divorced in 1913. His second marriage was to Mary Coyne of New York City, that marriage performed on January 3, 1914, with Henry Ford as best man. From that union there were two sons—John Harold and Childe Harold, Jr., and there was also a stepdaughter—Elaine. Once his lengthy working association with Ford ended, Wills built a team to develop his dream, the Wills Sainte Claire motor car, a car we'll study in much greater detail in Part Two. After that company failed, though, he tried to return to Ford. He contacted George Holley, the man who'd made the carburetor for the Model T and who was a close friend of Ford's. Holley relayed the message and Ford turned the decision over to his chief production manager Charles Sorenson who'd never liked Wills. His response was negative. While we don't know what Wills had expected that answer to be, a story of redemption he once told gives us an idea of how he might have answered if roles had been reversed. While at Boyer, his boss had talked with him about his future and had given him this advice: "aim high and you'll never shoot low." Wills internalized what he'd been told and built a phenomenal career. Many years later he ran across his former employer, now down on his luck and sponging off relatives. When Wills asked what he'd once looked forward to in retirement, the answer came: "running a chicken farm." A few weeks later Wills returned to see the man, handed him the deed to a chicken farm, and showed him a bank statement with $5000 in the man's account. In 1921, when the story was recounted in Motor Magazine, the man was happily raising 2000 chickens. Wills had viewed the chance encounter as an opportunity to make "deferred payment" for the advice once freely given. Nevertheless, Ford's answer was otherwise and it left Wills adrift. For a short while he joined other engineers in 1929 in developing the pioneering front-wheel drive Ruxton. Though his involvement with the car was limited to consulting on the prototype, he did serve on the company's Board of Directors. From 1933 onward, Wills worked as metallurgical consultant to Chrysler, there developing and refining patents on all-steel body construction for cars. He invented a new form of steel, adding aluminum to steel to achieve a metal with sufficient flexibility to form compound curves without tearing. That proved essential for the all-steel bodied Airflow. The sealed-beam headlight was another Wills invention of that era, one he sold to Westinghouse. Wills was one of the men who gave form to the dream of the American automobile. He invented numerous automotive products and processes. He was responsible for the technologically sophisticated Wills Sainte Claire. 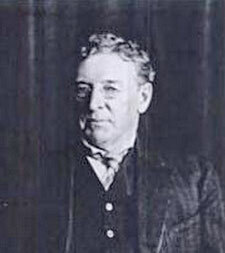 At age 62, however, he was felled by a diabetes-induced stroke and died on December 30, 1940. Wills is remembered as a tall, handsome man who was proud, confident, creative, and quick to make a decision. He was also well-spoken and a persuader who, one friend said, "could convince you black was white". That said, however, he never sought the limelight, ducking numerous requests for interviews over the years. One enterprising interviewer asked Ford to arrange a meeting with Wills but Ford replied that he couldn't get Wills to talk even if he "promised him another week's wages." Never a fan of rules and regulations, Wills was an independent, practical thinker who learned early to distrust much of what he read. More than once he told friends, "'If it's in a book, it's at least four years old and I don't have any use for it." Some said he was less inclined to stick to hard facts than he was to exaggerate or interpret them. Whether based on fact, intuition, or some combination of the two, he was acknowledged to be a mechanical genius with great common sense. He also was brave enough to disagree with the boss, at times openly criticizing Ford. Incredibly hard working himself, he was known to be demanding of his staff, as well. He could be gruff, impatient, hard to get along with, and a perfectionist who often thought a little more tinkering could make things, even very good things, better. But he was also amiable, fair-minded, humorous, and a real party animal. As his early and long-time friend Henry Ford once said of him, [he is] "the man the public think [sic] I am." Once Wills tasted wealth, he quickly learned to enjoy it. He appreciated fine jewels and carried quality gemstones around in his pocket. He bought extravagantly—paintings and furnishings as well as yachts and speed boats. In the late 1900s, he contacted Frank Lloyd Wright to build a mansion for him, one eventually designed by Marion Mahony, another architect in that office. When he decided to manufacture his car, he kept two households, one near his plant, another right across the river in Detroit. As was common with wealthy men of his time, he also played tennis, hunted, and fished. And he belonged to several local clubs and other national organizations, including the American Society of Mechanical Engineers and the National Automobile Chamber of Commerce. 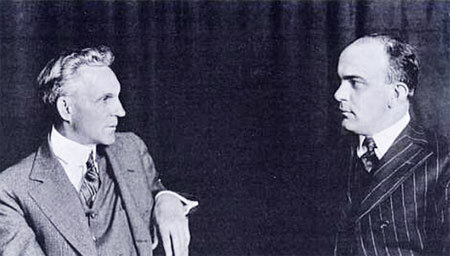 In 1899, at age 21, anxious to put theory into practice, Wills approached automotive pioneer Henry Ford, ten years his senior, about working as his part-time assistant. Ford was working at Detroit Edison at the time but had amassed sufficient financial backing to found the Detroit Automotive Company. Ford worked without pay at that concern and could do no better for Wills. The pair kept their day jobs and agreed to work together on the car early in the morning and late at night. Ford knew he wanted to build a gasoline-powered car so he would make rough sketches, expecting that Wills would use his talents as draftsman and designer to finish them. The two loved what they were doing and spent more and more of their waking hours on their automotive dream. There's a wonderful story that the two of them, unable to afford heat for their tiny, first-floor "factory", would work and work until their fingers were too numb to hold pencils or grasp tools. Then they knew it was time to stand up, don their boxing gloves, and go at each other until their circulation had improved and they could get back to work. Together they worked on the "999" and "Arrow" 26-hp race cars, meant to attract enough attention to convince backers to invest in Ford's company. They knew their way around tools, were hands-on experimenters, and had the confidence of youth that they could get things right. Ford had a vision that America needed a well-built, affordable car, and Wills had the ability to identify—and correct—problems at the drafting board rather than waiting for them to be caught during production. In late November 1901, the company was reorganized as the Henry Ford Co. In March 1902, however, backers who had yet to see a production car brought in Henry Leland as consultant to the company. Ford was furious and departed the company suddenly, after having secured a promise that the company would no longer bear his name. That promise was fulfilled when the company became Cadillac instead. By August, 1902, Ford had secured new backing. Wills witnessed the Memorandum of Agreement between Detroit coal dealer Alexander Y. Malcomson, the money guy, and Henry Ford, the idea man. The agreement established that Wills would take a salary of $125 a month, to be split 50/50 with Ford—since Ford was in a non-salaried position. But Wills was not to hold any share of the company. Wills wanted to continue his work but he also thought it only fair that he have a stake in the enterprise. Ford valued Wills and worked out an oral, private profit-sharing arrangement whereby he would share with Wills about 10% of his company dividends. Wills agreed to stay on as draftsman, principal shop assistant, and foreman of the production team. Since Ford was notoriously skeptical of any titles, however, he likely thought of Wills as his right-hand man. The organization was known as Ford and Malcomson but doing business as the Ford Motor Company and preparing to put a "family horse" on the market. The car that was completed just before Christmas, 1902, worked fairly well—but Ford and Wills thought they could do better. They began work right away on an improved design, one that was to become the Model A. That decision proved fortuitous since, in May 1903, Wills managed to total the first car while driving down Detroit's Mack Avenue. Ford and Wills needed a work force to turn their prototype into a production car, and they began right away to hire the men they needed. One of those new hires, Canadian Fred Seeman, would later relate that Ford and Wills got along "about as well as any engineering couple I've run across in my life, and I've run across a lot of them." Wills went on to work on many Ford models, experimenting with new metal alloys and designing manufacturing equipment and special machinery as well as the cars themselves. In 1904, Ford built the Piquette Avenue plant with several small, second floor experimental rooms. Wills spent hours experimenting with metal alloys and perfecting tools and processes. It was there, as well—on the south end of the second floor—that Wills had his office. He worked incredibly hard, calling a sandwich and a glass of milk at his desk sufficient lunch most days. 1904 also marked Ford's last race with the Arrow race car. On a one-mile straightaway course on frozen Lake St. Claire, Wills checked on the engine one last time before Ford took off on the ice. Ford would later recall, "With every fissure, the car leaped into the air. I never knew how it was coming down." Frightened yet determined, Ford completed the mile in 36 seconds, and afterwards Wills and copilot "Spider" Huff joined him for a muskrat dinner at Hotel Chesterfield, the event's sponsor. With Smith advising, Wills was put in charge of making the vanadium work. United Alloy Steel Co. of Canton, Ohio was willing to experiment with the process, and Wills traveled to Canton a number of times to oversee production. Once steel ingots had been turned into automotive parts, Ford began introducing vanadium in 1907 on Models N, R and S. And, when the Model T was introduced in October 1908, one of its selling points was its tough, durable, flexible vanadium steel. Ford's cars were now much stronger and lighter than those of his competitors. 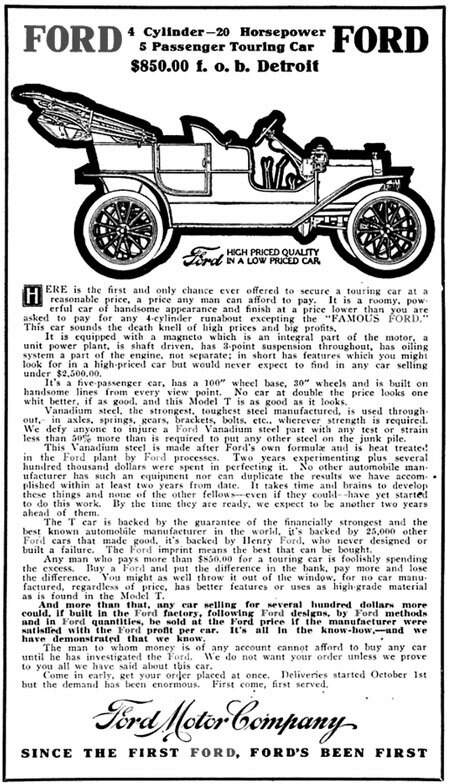 An excerpt from October 1908 Ford Times ad: "This Vanadium steel is made after Ford's own formulae and is heat treated in the Ford plant by Ford processes. Two years experimenting plus several hundred thousand dollars were spent in perfecting it." Work continued on one Ford model after the next but the most popular by far proved to be the Model T, with Wills by then chief engineer and factory manager. One of the most significant Wills contributions was its planetary, pedal-operated transmission, an idea he said came to him one morning as he soaked in the tub. The Model T transmission was a forerunner of automatic transmissions, i.e., one pedal controlled the clutch for high or low gear change, another was depressed to reverse, and a hand-controlled lever combined neutral and the parking brake. There was no separate clutch pedal. A fairly simple innovation for the Model T was to enclose the underside of the car with a one-piece steel cover that fitted over the car's engine, flywheel, transmission and universal joint, keeping road dust and grime, rain, snow, etc. out of the car's works. Wills worked in close association with the John R. Keim Co. of Buffalo, New York to use their steel-stamping techniques to manufacture these car parts. He also developed a relationship with the company's president John R. Lee who would, after a stint with Ford, partner with him in developing the Wills Sainte Claire. Wills also collaborated on the pioneering development of the assembly line, the transverse leaf-spring suspension, and the 4-cylinder engine block cast in one piece— with detachable cylinder head. The detachable head was not only easier to manufacture but made maintenance valve jobs much easier. And mechanical features were far from the only contributions Wills made to Ford. In the early 1900s, when the company wanted a corporate logo, Wills met the challenge. Some say he enlisted his calligraphic skills while others say he utilized a printing set with flowing script he'd given one of his children. Still others claim he used a printing set found in his attic, one he'd used in his mid-teens to produce visiting cards and earn a little money. Whichever tale you believe, Wills is credited with designing the Ford script and oval still recognizable today. Despite the many contributions Wills made, Ford workers began noticing some fraying of the close Ford-Wills relationship as early as 1908. It was their disagreement about the Model T, however, that led to real and permanent trouble. Ford knew he had a winner with the Model T and wanted it left alone. He did agree to some updates from time to time but even those new parts had to remain interchangeable with the original ones. Wills, though, itching to flex his creative muscles, wanted to keep tinkering with it. So, in the summer of 1912 when Ford was on a family trip to Europe, Wills saw his opportunity to explore alternate design ideas. He ordered suppliers to tool up for a new model, one that was a bit longer and lower than the original, with smoother lines. Upon his return, Ford viewed the prototype and was decidedly not amused. He destroyed the prototype, cancelled the unauthorized orders, and, no doubt, had a few choice words for the friend who had betrayed him. Wills, while used to taking punishment from Ford, may not have foreseen the severity of Ford's reaction. Colleagues over the years noted that Wills sometimes didn't come to work until 11 AM. He may have felt burned out, under-appreciated, stifled, untouchable—or maybe he just yearned to produce a car of his own. The suppliers for the prototype had been Dodge brothers John and Horace, makers of Ford parts since 1902 and minority shareholders of the company. Ford's new River rouge plant was under construction, and as it came on line Ford saw no further need to purchase parts from the Dodges. In 1913, the Dodge brothers took the prototype, refined and built it, and began producing it as a Dodge car. It was a success. Because Wills held patents on all-steel bodies, punch presses and spot welding, he made money from the new venture, as well—and he continued to do so as other car manufacturers licensed his patents. All that didn't sit well with Ford who, in 1916, said there would be no more Ford dividends paid to shareholders (such dividends to the Dodges having been used to bankroll their new car). Henry Ford resigned from his company on December 18, 1918, leaving son Edsel in charge. Following a lengthy leave, Henry announced that he was organizing a new company that would produce cars at a price point of $250. Whether the announcement genuinely frightened competitors or whether they just wanted to move on from an association with Ford, minority shareholders like the Dodges sold their shares at reduced prices and left Ford a family-owned company. The Dodges, however, were also clever businessmen who sued Ford over his decision to stop paying dividends. In that action Wills testified on Ford's behalf but a court decided in favor of the Dodges. Wills may not have been totally on board with Ford's cause, anyway—because he was still smarting over Ford's rejection of the "improved" Model T. Another cause of increasing friction between the two came over Ford's decision to establish a separate company in 1915—Henry Ford & Son Co.—to make Fordson tractors. Rather than continuing to use vanadium steel, he chose to work with steel of greater strength. That reduced somewhat the value of shares Wills held in a vanadium company. There were more important national interests than how Ford operated or whether Wills amassed a greater fortune, though. In the fall of 1917, the U.S. Government ordered 22,500 Liberty aircraft engines (12-clinder, 400-hp) for use in World War I, and Ford was asked to provide some of them. For the crank shafts and connecting rods Ford used molybdenum steel, a steel alloy that would later prove so important in the production of the Wills Sainte Claire. Since the Liberty engine was not the only War work in which Ford was engaged, its development was ceded to Wills. He assisted in the design and manufacture of the engine, starting with a cold forging process that reduced the price of cylinders significantly. Thereafter Ford was tapped to provide cylinders to all Liberty engine manufacturers. When, after production was already underway, General Pershing called for engines with greater horsepower, it was Wills once again who, grudgingly, met the need. During this time he also generated a number of inventions related to the War. One such invention was the engine for the 1917 Charles Kettering aerial torpedo "bug", a small biplane with a bomb payload of about 150 pounds, the unmanned aerial vehicle of its day. Launched from a wheeled trolley, an onboard gyroscope guided the plane to its target. Once the programmed number of engine revolutions had been reached, the engine shut off, the wings detached, and the bomb struck earth. The bomb was powered by a 4-cylinder, 40-horsepower De Palma engine produced by Ford at a cost of about $40 each. Wills and race car driver/builder Ralph de Palma had first, at Kettering's direction, built an air-cooled, 2-stroke opposing cylinder engine that didn't work in the "bug". Instead, Wills and de Palma designed and built the 4-cylinder engine that got the job done. Once the War had ended and Henry Ford had expressed his intent to run his company as a personal fiefdom, it must have been clear to Wills that he no longer had a future with the firm. 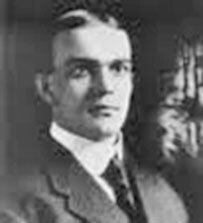 On March 15, 1919, he resigned, having made sure that Ford made good on his earlier promise of dividend-sharing, its value fixed at $1,592,128. Wills, at 40, had amassed more than $5 million from a combination of salary, buyout, financial interests in several of Ford's steel suppliers, and royalties on metallurgical patents. Wills explained his departure, saying that he was "anxious to do something worthwhile and this seems the opportunity to start." He had his cap set on building a better car. Just days after Wills departed Ford, another Wills colleague—John R. Lee, labor relations expert at Ford, resigned as well, with plans to join Wills in his venture. Lee had been president of Keim Mills, one of the companies producing parts for Ford, when Ford bought the company and moved it to Detroit. In 1914, Ford moved Lee to the front office and asked him to update the company's labor policies and curb worker attrition. Establishing an employment department, Lee instituted a "skills-wages" job classification system to match worker skills with labor needs. He also promulgated a job-ladder system that made promotion opportunities clear. Most famously, however, he headed the personnel department when wages were increased and hours were reduced. And it was on his watch that Ford instituted a $5 a day pay rate—half wages, half profit-sharing. The employee buy-in for that handsome salary was that they submit to unannounced company checks of their work place and their home. They were to abide by standards of conduct which Lee had put in place: clean homes, children in school, alcohol in moderation, regular bank account deposits, etc. As Wills and Lee departed, Ford remarked," It is my fault. They are very able men, and you have got to keep something in sight ahead for men of that type. I wasn't able to do it, and they can't be blamed for going into it for themselves." They were not the only refugees from Ford to join forces for the new venture, either. Among that contingent were machine-tool expert Charles Morgana who was to be vice-president and director; machine specialist and tool designer Oscar C. Bornholdt, factory manager; metallurgist and Wills protegé Henry T. Chandler, continuing his metallurgical experiments; and William M. Purvis, assistant sales manager. There had been some talk that Ford marketing genius Norval Hawkins would also join them but he went, instead, to General Motors. Numerous other unnamed Ford-trained employees would follow Wills and Lee on their grand adventure. In Part Two we'll take a look at the car Wills produced, the mechanical wonder of its time, Wills Sainte Claire.